Wednesday morning we rose early and were at the trailhead at about 7:15am. It was quite chilly. I had reservations about taking two layers of sweatshirts cause I knew it would warm up quickly, but didn't want to get stuck in the wilderness shivering to death. 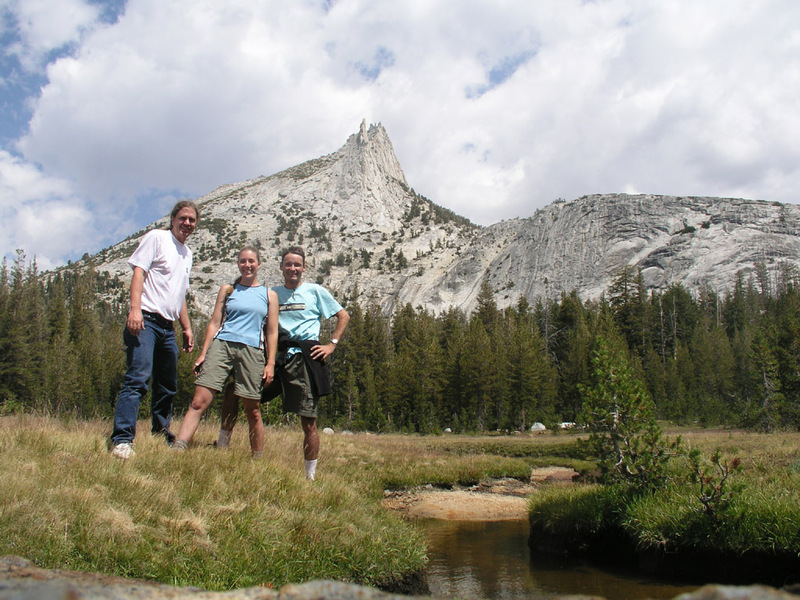 We intended to follow Christopher Brennen's excellent route from Tuolumne Meadows to Pywiack Dome. We started bushwhacking up Budd Creek only to discover a bridge a short way up the creek. We found an ok trail that followed the creek, then finally ran into the real trail. I led most of the way up the creek bed cause I knew I wouldn't be leading anything steeper than that. About a mile and a half in, as Chris' route indicates, we found slabs, but lost the trail. We crossed to the left side of the creek as his route indicated but never really found the trail again. Once we were due east of the summit it was clear that we needed to head up. We climbed the talus right next to the slabs. It was like climbing a mountain of marbles. Eventually we topped out at the saddle. We had to downclimb about 30 feet before we could safely traverse over to the ridge between the Eichorn Pinnacle and the summit. We re-checked the route description. It indicated it would take about 30 minutes to get to the belay station below the summit - this seemed like a long time, until we actually started climbing ourselves. The ridge was steep and challenging. Eventually we started climbing switchbacks. Right before the belay platform, there's a neat little exposed corner where a missed step would mean a fall of hundreds of feet to ones death. Rita and I needed to due a couple of gut checks before we got passed the corner, and I began to have serious concerns about whether I'd be able to summit. 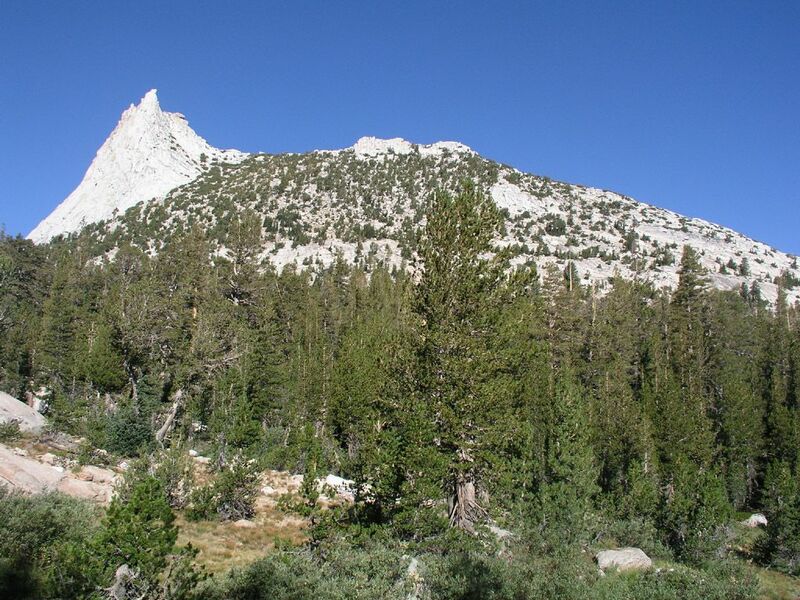 The summit was described as a 15' class 4 traverse with several hundred feet of exposure, followed by a 15' crack climb. I climbed past the obvious belay point to the beginning of the traverse. Fortunately there's a 15' sloped ledge below the traverse, which effectively blocks your direct view of the dropoff. I quickly decided I could handle the traverse, and assumed the class 4 climb would be just as easy. Kent quickly led the way up and established a top rope. I went on belay, climbed over the ledge, quickly traversed to the crack. This was no class 4 in any rating system I was familiar with. It was quite a vertical offwidth crack with a huge step at the bottom. I've climbed 5.4 climbs in Arizona that were this hard. I didn't bring my rock shoes, and didn't know how I was going to climb this in sneakers. After a minute or so I realized there were actually two cracks, and the climb would be relatively easy using both cracks. I struggled up and summitted. The summit was described as flat, with enough room for 4-5 people. I suppose it was more or less flat, but it had a significant slope to it. I don't see how you'd get more than 3 people on it. I was afraid that I'd panic as soon as I reached the top and would need to get off the summit as soon as I was on it. I overcame my fear, managed to enjoy myself, and split a summit beer with Kent. Kent lowered Rita and I off the top, then he downclimbed. 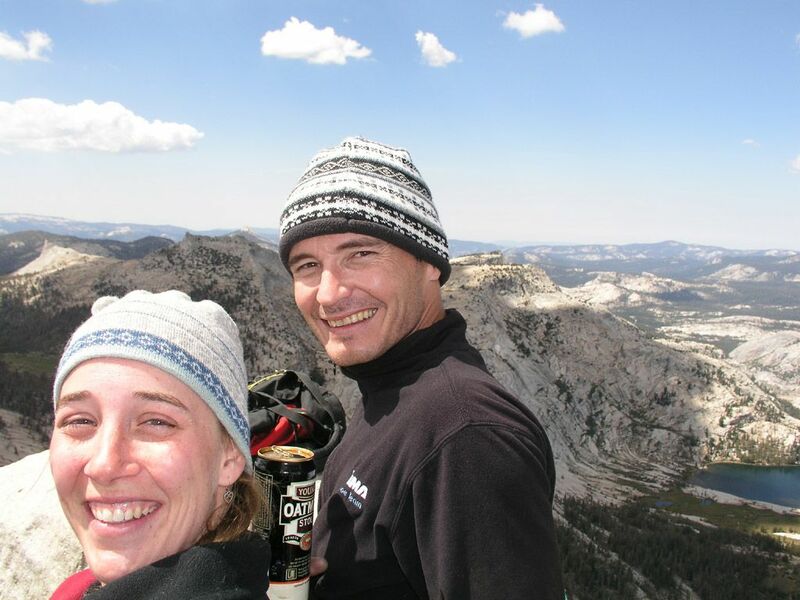 Rita and I then rappelled the entire rope length down the northwest face to avoid lots more downclimbing. Kent rappelled a half rope length, then climbed down to meet us. 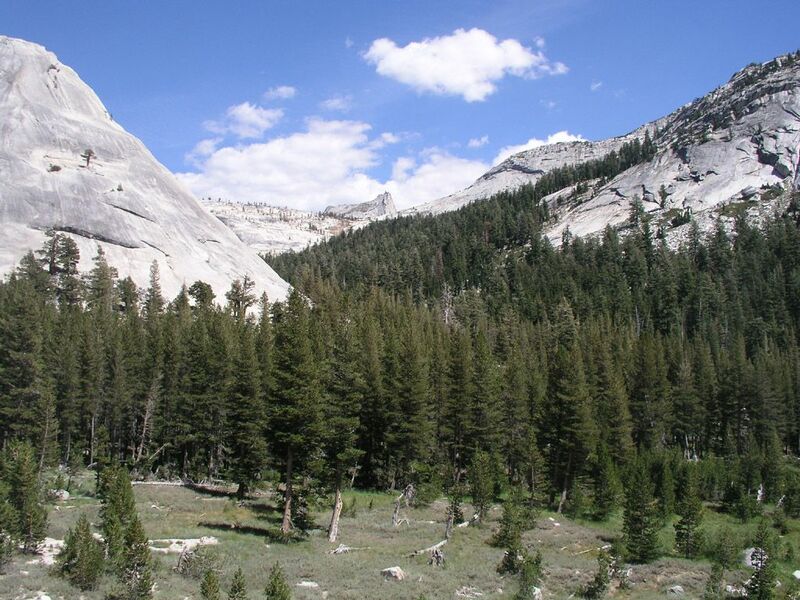 We bushwacked down the northwest side, occasionally finding cairns and trail remnants. We relaxed once we hit the treeline. 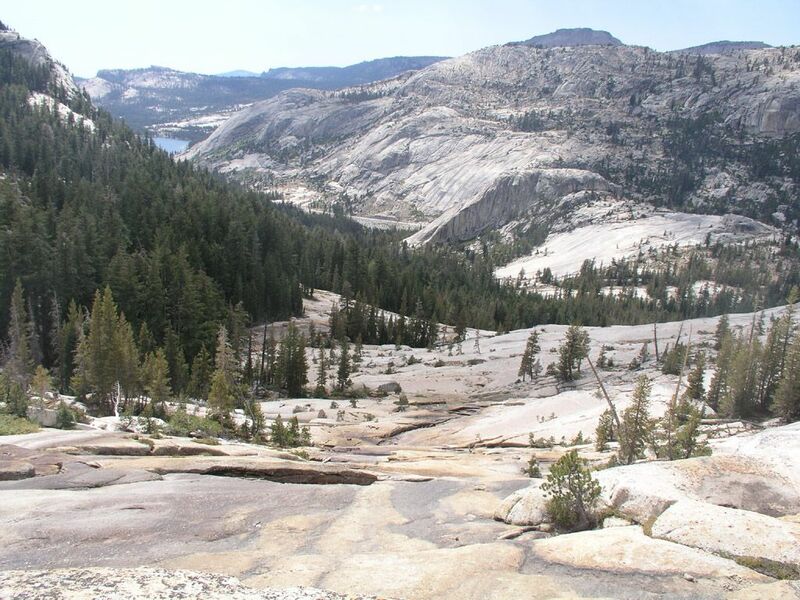 We intersected the John Muir Trail, then we turned off towards Lower Cathedral Lake. We had lunch by the creek. 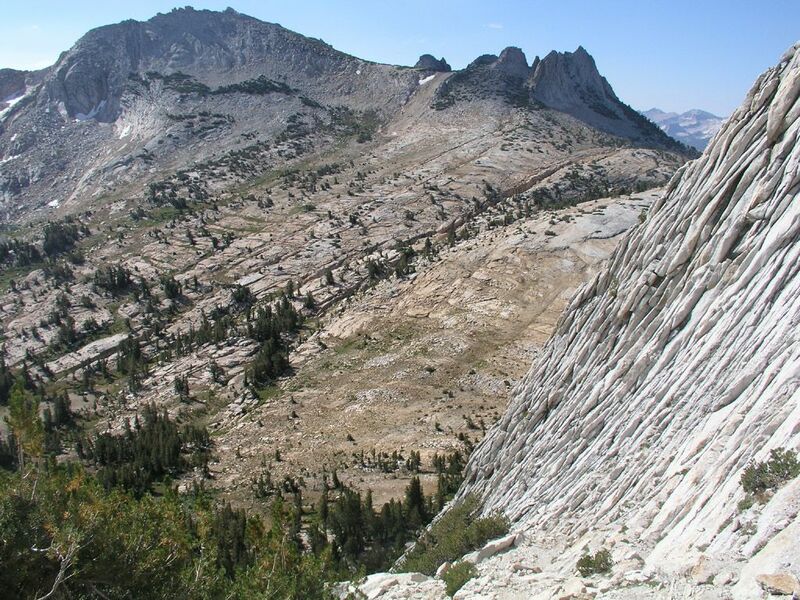 We could hike nearly straight down the slabs. At the base of the slabs we had to bushwhack again - quite a serious bushwhack this time. We finally got back to my Ford Exploder at about 3:30 - about 8 1/2 hours after we started. 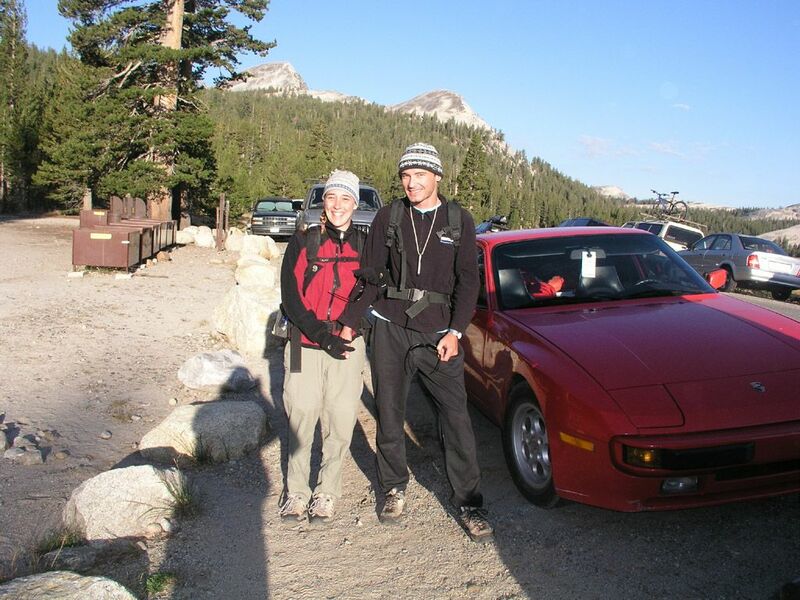 I drove Kent and Rita back to their Porsche and headed back to camp. 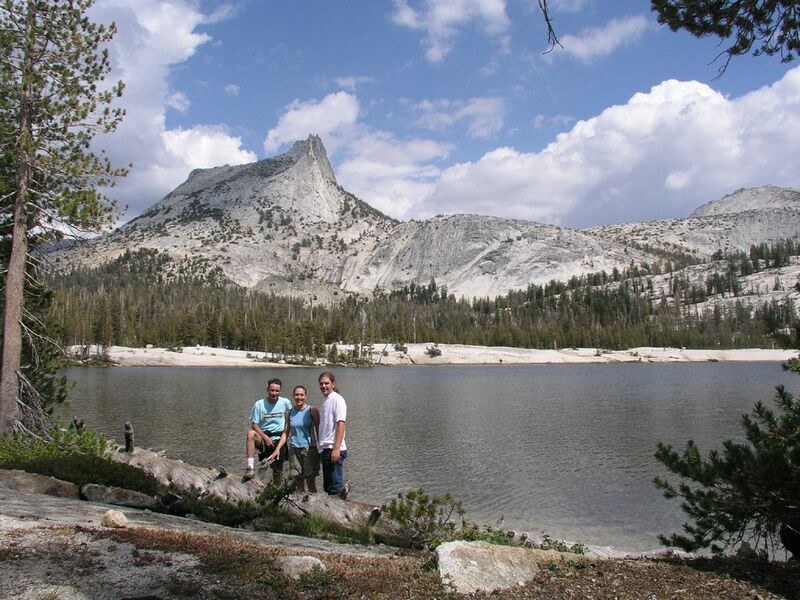 We stole showers at the Tuolumne Lodge and rested on our laurels.